I recently read an article by Mike Pierce, otherwise known as “Antarctic Mike.” In it, he said that not all of us are called to lead. …although not all of us are called to be leaders. Think about this for a minute. Every single person every day is in situations where they have to think on their feet, respond to change and deal with circumstances that are not favorable, are constantly changing and seem difficult, if not dangerous. Picture the 10 year old at school who has to make a decision on his/her feet, about doing the right thing, saying no to drugs, and saying yes to doing their homework. Picture the employee who finds himself/herself in the middle of a conversation with an upset customer. Picture yourself in a moment when nobody is looking or watching and you have to make a split second decision to do what is right. These circumstances are common to all of us every single day. The right outcomes are predicated upon people thinking and acting like leaders. It’s really that simple. So the principles of leadership apply to all of us, whether we are “leaders” in the traditional sense of the word or not. When it comes to examples and role models of great leaders, Mike states that there are many choices. One of Mike’s favorite choices of a great leader is the Irishman, Sir Ernest Shackleton, one of the greatest polar explorers in history. Why did he choose Shackleton as his role model of how to be a great leader? Antarctic Mike ran into the 1914 Endurance story on a random stop in a bookstore in Bakersfield CA in August 2001, while on a business trip. Mike picked up the book titled Shackleton’s Way and within minutes of thumbing through the book, he knew it was a blueprint of how to be a great leader. Set the expectations high from the start: When you look at how Shackleton recruited his crew of 27 men, it is more than obvious that from the very beginning, he let people know very clearly that this expedition would be the most difficult, if not dangerous, thing they had ever done. The details of each person’s job were clearly laid out in writing, so that there was no ambiguity or confusion as to what each person’s role was. This is one of the reasons why so many companies don’t have the right people on their team performing at high levels. Most employees today want to know very clearly what is expected of them, and many companies fail this, as most job descriptions are nothing more than a basic outline of minimal skills and competencies that satisfy HR, but don’t’ tell the person doing the job what the expectations are. Rewarded and Recognition: Shackelton was a master of this skill. One example is a holiday that he created called “Mid Winter Day Celebration.” This was the day in the middle of the winter where the crew of the Endurance threw a big costume party, celebrating the fact that the long and dark Antarctic winter was half way over and now the sun was moving back toward them. This was very important to the team, as it’s pitch black in the Antarcitc winter for 3 months, so celebrating the fact that it was half way over and that the sun was now returning was a culture changing move. It’s a great example of a leader who was very CREATIVE with respect to recognition and celebration for his team in a way that was timely and meaningful to the team members. This is a critical must have today. Leaders know how to recognize others and celebrate important moments in people’s lives in a way that is significant and timely for them. Set the example: Now that we have recovered most of the journals and records of the 28 men, the most common denominator was the fact that Shackelton as the leader was one who volunteered to take on the difficult people and the difficult parts of the job. Shackleton was often the first to wake up early in the morning and often the last to go to bed after a long and hard day. Remember this: people watch you. The example you set speaks much louder than the words you say, whether its your employees, co workers or family members. 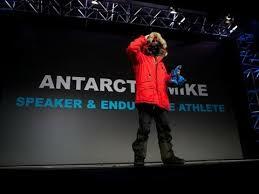 Antarctic Mike challenges us all to be a great leader. Every single day in our companies, communities and families, all of us are called to lead every single day. Ernest Shackleton is a great example for all of us to follow.